So, the YMCA has a major water leak in the pool and has to close it Feb.8 through the 20th. That is a very long time to not be swimming. They tell me I can go to the Cooper Y or the Northeast, but 1. I don't have a car and 2. I have no idea how busy those pools are and wouldn't know when was a good time to go. 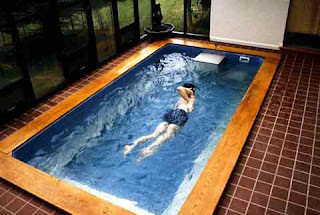 So, basically, I think my landlord should put in an "endless pool" for me and Tony. We're good tenants, and he already broke down and got us washer/dryer...so what's one more thing? Last week I was freaking out (unneccessarily I guess) about my placement tests. I did fine...great in English (didn't miss any) and so-so in math (placed higher than I thought-don't have to take "math for dummies"). Now I'm just waiting for my SCC letter to get in the mail with the go-ahead to register...and my w-2 from the Zoobar so I can get my taxes done/FAFSA done. So many hoops to jump through...makes you wonder. Classes start in April, here's hoping the Government will give me some money. Sunday I am going to bake a lot of bread and hopefully make some curried peanut soup. Looking to be a nice day off.